Wildlife crime has become a multi billion euro annual business. The poaching and trafficking of endangered wildlife species such as rhinos, elephants, and tigers as well as innumerable less iconic species occurs on a truly industrial scale. Wildlife crime is also causing irreversible harm to biodiversity and is disrupting local communities. Wildlife crime goes much beyond the poaching and trafficking of endangered wildlife species such as rhinos, elephants, and tigers as well as innumerable less iconic species occurs on a truly industrial scale. Wildlife crime is more lucrative than trafficking in cocaine: higher margins, lower risk. There are very few states that do not have laws against wildlife crime or, as a fallback, on money laundering tax evasion, or on corruption. Wildlife Justice Commission A group of leading experts and organizations from the world of justice, wildlife crime and nature conservation came together to establish a new and innovative organization. The Wildlife Justice Commission is designed to end impunity for transnational organized wildlife crime and the corruption that is driving it by ensuring that governments enforce the law. WJC exposes criminal networks through a unique, collaborative investigation capacity linked to an innovative accountability mechanism. The Wildlife Justice Commission exposes, disrupts, and helps in the dismantling of criminal networks that are involved in transnational organised wildlife crime, including illegal logging and illegal fisheries. 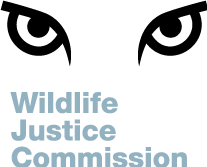 The Wildlife Justice Commission's way of working is as follows: The Wildlife Justice Commission conducts in-depth investigations that result in a Map of Facts that, among other, describes in detail the wildlife crimes perpetrated and the criminal networks involved. This Map of Facts is highly actionable for law enforcent authorities The Map of Facts is reviewed by two Accountability Panel members (international panel consisting of independent criminal lawyers and organised crime experts). The Map of Facts is handed over to the relevant authorities, requesting activation of the rule of law in a spirit of collaboration. The relevant authorities work with the Wildlife Justioce Commission on an Action Plan. If the relevant authorities are unresponsive and a concrete action plan does not emerge, background pressure is exerted through the Panel of Ambassadors. If still no action is taken, the Wildlife Justice Commission will organise a Public Hearing in the Hague, in which the Map of Facts will be presented for review by the Accountability Panel. Based on the report of the Accountability Panel and its recommendations, the Wildlife Justice Commission Ambassadors will work to get an Action Plan implemented. If necessary the Ambassadors will find ways to leverage pressure including the use of sanctions. The Accountability Panel consists of highly respected individuals who have a background in, or affinity, with the rule of law, transparency, and knowledge of corruption networks. These individuals are outstanding people of the highest level of integrity, moral character that can act independently in assesing the Map of Facts. The Wildlife Justice Commission is in possession of extensive intelligence identifying several organizations involved in the trafficking of CITES I and II listed birds, primates, reptiles and amphibians across four continents. Most of these animals are still alive. The Wildlife Justice Commission will commence an operation in March 2016 focusing on Asia and targeting several major individuals linked with these criminal organizations. This project received a grant from the Nando and Elsa Peretti Foundation. The goal of the project is the exposure, disruption, and ultimate dismantling of key transnational wildlife crime networks active in poaching and trafficking of endangered species and illegal wildlife products from Asia to among other Europe and the United States. Due to the confidential nature of Wildlife Justice Commission's work and in order to saveguard its researchers in the field the Wildlife Justice Commission can not, at his stage, be more detailed about the aspects of the project. Project timelines The project is expected to start in March 2016 and will last around one year. The duration largely depends upon the results obtained from the research and investigations. The Else and Nando Peretti Foundation is deeply committed to environmental issues and wildlife conservation. The Wildlife Justice Commission is honored and proud to have such a committed and highly respected partner to support this project.